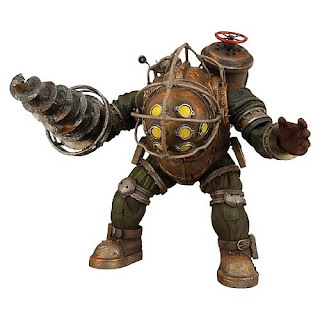 For $20 you can now get this latest entry from the "Things We Don't Really Need But Are Lusting For Terribly" file: the BioShock Big Daddy Ultra Deluxe Action Figure! Those big lumbering brutes that once guarded the Little Sisters in Rapture can now be guarding your desktop. Figure comes with full articulation, removable oxygen tank and deadly drill arm. Doesn't look like the helmet is removable though (which might be a good thing). Click here for more product and ordering info, would you kindly?